Hello there! Did you have a nice, long weekend? Here's another card made with the newest release from Purple Onion Designs. Super simple and easy to mass produce. Take a closer look at the "grass". Nope, I didn't have to whip out my sewing machine--it's stamped! It's from a Stitchery set by Sassafras that's probably discontinued because I can't link it anywhere. I do hope another stamp company will produce some stamps with stitches. I especially like the "wonky" stitching and the fact lazy ol' me doesn't have to drag out her sewing machine. And for another look at these amazing stamps, check out this blog post from my sweet friend Emily. 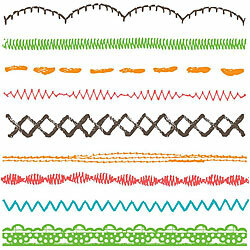 She was the winner of my recent giveaway which included a set of the Stitchery stamps. Her card is amazing and even her hubby was impressed! Rumor has it that I have another set of these fun stamps somewhere....can you say "giveaway"?? Stay tuned and wish me luck in finding them! It's been a while since I've participated in One Layer Wednesday challenges. I was so surprised that it was already up to #55! Challenge #55 is to create a one layer card and use a cat or dog image on your card. I've had several Paper Smooches stamp sets for a while now, still waiting to be inked. I stamped the dog and sentiment from the Birthday Buddies set and colored the dog with Copics. To "ground" the pup, I stamped a (discontinued) ribbon stamp by Hero Arts. Done! Here's a close up view of the stamped ribbon. Doesn't it look like real ribbon? I'd forgotten how fun it is to create one layer cards--and they're quick, too. If you want to play along, you can find out about the challenge details here on Jennifer's blog. 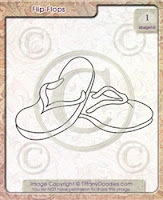 Have a flip floppy summer! If you love freebies, you should check out Tiffany Doodles' Freebie Thursdays. Each Thursday, Tiffany has a free digital stamp up for grabs for a short while and then it goes into her store. This digi was a freebie a few weeks ago and I grabbed it right away. I flipped one of the images to get a reverse image before printing it on patterned paper. I colored the straps and the bottoms with a Copic marker. I attached the image to a piece of corrugated paper that I swiped with some white pigment ink. The sentiment was handstamped with some alpha stamps. I added some sheer ribbon and buttons and the card was done. This image is no longer a freebie but can be found here in the Tiffany Doodles store. Thanks for visiting today. Hope you're having a great week! Hello friends! I'd like to share a card that Michele shared on her blog, using the newest release by Stephanie Ackerman for Purple Onion Designs. I combined the Bird House, plus the little birdie, with pennants from the Build a Banner set, and the cute Chick Sentiment. The background is stamped with Hero Arts Large Canvas Stripes. All the images were colored with Copics. And I'm so excited that my good friend Alice has joined me on the Purple Onion Designs team! I know she's going to create amazing cards and it's going to be so much fun working with her! Thanks for stopping by today...Hope you're all off to a great week! Hello, friends! I want to share a matching envelope and card that I created for the latest Penny Black challenge. First, the card. I stamped Amongst the Stars and colored the images with Copics. I used Reverse Wonky Rectangles to cut the card and the frame, which was stamped with Hero Arts Graph Background. The sentiment is from this Hero Arts set. I added some Stickles to the largest star and a few drops on the background. For the envelope, I stamped Mimi partially on the corner and colored her in the same colors as the card. I cut a cloud template and sponged the sky, then ink distressed the edges. I'm not sure how the postal system feels about glitter, so I just dabbed a few stars with some Stickles and my matching envelope was done. I'm going to test the postal system and mail this out to a little friend. I hope it reaches her....wish me luck! Hi there! Have you met Fairy Klara? She's a digi created by my talented friend Jane. All proceeds from the sale of this adorable digi will go towards a fundraiser for the Juvenile Diabetes Research Foundation in honor of Caylin, the daughter of a sweet friend, Kristina Proffitt. You can purchase Fairy Klara here, and also visit Caylin's Cure to see how you can donate and be eligible for prizes from some awesome sponsors! Wouldn't she look great on a card from the tooth fairy? Or a birthday card, or even a friendship card for a little girl. Please consider buying Fairy Klara to help support Caylin and other families dealing with juvenile diabetes. Hello! Hope you all had a great weekend! I'd like to share another card using the new Home Sweet Home stamp set. This is a fun set with lots of images and sentiments, too. My card uses the Reverse Wonky Rectangles die as the card base. I ink distressed with Walnut Stain and water splotched the top portion of the card. The other pieces were stamped on patterned paper and ink distressed. The bird is from the Bird Cage set, colored with Copics. To finish the card, I added a bit of faux stitching around the edge. Hello, friends! Thanks so much for dropping by! I wanted to share another card with Purple Onion Designs' newest release by Stephanie Ackerman. Home Sweet Home arrived and I couldn't wait to try some paper piecing with this fun set. I pulled out the new Valise papers by Memory Box. It's a different look for Memory Box, and it's printed on kraft, so naturally, it was calling my name! I stamped all the pieces on different sheets in the pack and assembled this little scene. I also used some washi tape from The Greeting Farm which fit perfectly as the ground and the colors matched, too. The background was stamped with Envelope Pattern from Hero Arts. I love how it gives the card some subtle texture. Some pieces were raised on pop dots for dimension, and a bit of twine on the bottom was the finishing touch. There are several sentiments in this set. I think this card would be perfect for a housewarming, Father's Day, or just to say hello. Hope you have a fun weekend, whatever you do! The latest challenge at Hero Arts is Fabulous Flowers and ATCs, with a technique using colored pencils. For my ATC, I stamped the bicycle and clear embossed it then ink distressed with some distress inks, then water splotched the sky. I punched out some mini flowers and added them to the basket, and stamped the sentiment after cutting it apart to fit. The ATC looked a little lonely by itself, so I mounted it on a kraft card and then layered it on to some dark brown cardstock, both of which were stamped with Large Canvas Stripes. I used more of Kiara's pink seam binding for a scrunched bow. Now my ATC has a home. To celebrate Tiddly Inks' birthday, they're having a Puzzler Adventure with lots of great prizes! Go here for all the details on how you can join the fun. Christy has lots of new digis in her store, but her Hugg-a-Buggs are still near and dear to my heart. They're the first images I bought from her and I've been a "coloring friend" ever since. Here's my card featuring Cherry Bugg, one of my all time faves. Don't you love those stacked cupcakes? Yum! I'll admit this is an older card that I've never shared on my blog before, but it's so appropriate for a birthday celebration. I made the dotty background by clear embossing Hero Arts Cling Dots and ink distressed with Fired Brick distress inks. The image was colored with Copics and I added a few highlights with a white pigment pen. Happy Birthday, Tiddly Inks! Here's to many more years of Tiddly Inkin' fun! 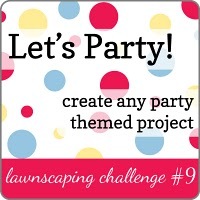 Lawnscaping Challenge #9 -- Let's Party! Here's a closer look at one of the cards (made with salvaged pieces!) that I shared in yesterday's blog post. I'm also entering it in the party themed challenge at Lawnscaping. I first stamped the background with Hero Arts' Large Canvas Stripes and used some Spellbinder Nestabilities to die cut the large and scallop circles for the base of the card. I just love the newest Lawn Fawn critters, especially the cute hedgehog, and decided she was the perfect size for a small card. I reattached the pennant flags and gave the hedgie a little party hat from the Hats Off to You set. I used a salvaged cupcake and added a little candle from the Bake Me a Cake set. The sentiment is from Just My Type Too. Party on, hedgie! I've been on such a kraft kick lately. Part of the reason is a dear friend gave me tons of it (Thanks, Phyllis!) since her niece was doing some housecleaning, and I just love the way colors pop against it. You'll be seeing a lot more kraft because my Purple Onions order just arrived and I can't wait to share more cards with you. Hello friends! Thought I'd share one of my favorite products and one that you should have right in front of you on your craft desk at all times: UN-DU. I ♥ this stuff! I was introduced to UN-DU over 20 years ago at a Making Memories workshop. We scraped off photos from old photo albums so easily and there was no damage to the photo even if UN-DU dripped on it. Amazing stuff! I've used UN-DU countless number of times to remove pieces from a card and still be able to salvage the card because the UN-DU just lifts it off. The adhesive stays tacky, too, so you can reuse the same piece again. Here's an example of the amazing properties of UN-DU. After I finished making this card I thought it was waaaaaay too busy. I was trying to put too many elements on one card. Yikes! So I pulled out the UN-DU and removed everything from the card and turned it into two cards which made me happy. I was glad that I was able to save the pennant banner, the cake, the cupcakes, and even the sentiment for the new banner. I couldn't have done it without the UN-DU. Magical stuff! And on that note, I'm off to get another bottle of UN-DU with a 40% off coupon from my LSS. I'd like to wish a Happy Mother's Day to all moms, anyone who's like a mom, and moms of furbabies, too! International Scrapbooking Day Sale at POD! In honor of International Scrapbooking Day, Michele is having a sale on many of her popular stamp sets up to 50% off, TODAY only! There's no direct link to the sale but you can browse the store and look for the discounted prices marked in red. Lots of journaling sets are available like this set, Road Trippin' on sale for $7! And this set, Seasons Date Me, is on sale for an amazing $4! 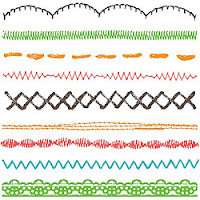 Even if you're not into scrapbooking you can incorporate these sets into cardmaking as well. 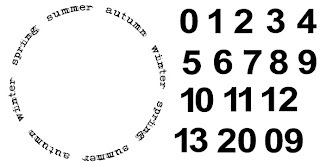 All Purple Onion Designs stamps are made of deeply etched, unmounted rubber. Even if you don't have any mounting cushion, they stamp clean and crisp every time. This is a one day only sale, so hurry over to Purple Onion Designs' store and take advantage of the half off sale today! Run!! This month's challenge at Tiffany Doodles is to use flowers on your card. Tiffany has TONS of flower digis on sale in her store, from magnolias to cherry blossoms to bluebells, all drawn realistically by Tiffany herself. For my card, I chose to use a whimsical design and one of the "older" digital stamps--a topiary. I printed the digi three times and played with the size so the middle topiary would have more height than the other two. I colored two sets of images with Copics and used pop dots to raise some of the tulips and the flowers for a bit of dimension. The background is Hero Arts Graph Background and the sentiment is computer generated. I added a drop of Liquid Pearls in the center of each flower and the lovely seam binding was given to me by my dear friend Kiara. She created the sweetest shade of pink that was perfect for my card. Thank you, Kiara! The challenge runs for two weeks and you don't have to use a Tiffany Doodles digital stamp--you can try and win some! Please visit the rest of the design team (see the list on my sidebar) for more inspiration. Tiffany also has some great specials this month. First is a Mother's Day special from now through May 9th. Use the coupon code "mom" at the checkout. And for the entire month of May, spend $30 in the Tiffany Doodles store and receive $10 off! Be sure to use the coupon code "morning" upon checkout. We hope you'll join our flower challenge this month and win some of Tiffany's awesome digis, too! Happy Aloha Friday! Just sharing a card using one of the newer stamps from The Greeting Farm--Surfer Anya. Isn't she a cutie? She and Surfer Ian are such a cute couple, too. I colored her with Copics, trimmed her out and used some corrugated paper and kraft cardstock for a little beach scene. The background is Hero Arts' Raindrop Background, stamped with Frayed Burlap distress ink. The sun die is from My Favorite Things, and I added lots of buttons for color and fun. The sentiment was made with Harold's ABCs from Lawn Fawn. The Greeting Farm is once again sponsoring Cards for a Cause for 2011. This year, cards are being sent to some students in Japan who could use some cheering up after the horrific earthquake/tsunami in March. You can read about the card drive here. I'm planning to color a bunch of Surfer Anyas and Ians and spread some ALOHA all the way to Japan! Thanks for visiting today! Please join me tomorrow for another Tiffany Doodles challenge. Purple Onion Designs giveaway winners! Word of Purple Onion Designs' new stamp giveaway spread quickly and there were 180 comments left on Michele's blog! Wow! Go here to see if you're a winner! Here's another card I made with some stamps from the new release. I had so much fun putting this card together. All the images were colored with Copics and I added a few highlights with a white pigment pen. Isn't that the cutest sentiment? The background was stamped with Hero Arts' Raindrop Background and all the images were attached with dimensional tape. Hope you managed to scoop up your favorites from the release. There's also a Sentiment Sale going on with some great sentiments on sale for just $1 to $2 each! Get them while you can because they're selling out fast! Hello, friends! Are you excited about the new Purple Onion Designs stamps that were previewed? Well, don't walk...run!......to Michele's blog post here, and leave a comment on what you're excited about and you could win a set of the new release! You'll see more wonderful samples from the rest of the design team, too. For every 25 comments, Michele will randomly give away a set of the new stamps. 50 comments means two prize packages; 75 comments means three prize packages, and so on. Pass the word along, too, because more comments means more prizes up for grabs! The giveaway will end tomorrow, May 3rd at 9pm EST. One comment per person, please. P.S. Michele has opened the store a day earlier than expected! New stamps are here. Let the shopping begin! Purple Onion's new stamp previews! Hello! I hope you're all having a great weekend. I'm so excited to finally share some previews of the newest stamp release by the talented Stephanie Ackerman for Purple Onion Designs. I just love her whimsical, homespun style and when Michele sent me the stamps, I knew what I wanted to do, and put my cards together so quickly. Such happy stamps! I used Heart Flower and paired it with Flower Quotes for my shaped cards on kraft. The flowers were colored with Copics and attached with dimensional tape. I added a bit of Glossy Accents and Stickles to the hearts. The backgrounds were stamped with Hero Arts Raindrop Background or Large Canvas Stripes. The "grass" was made with some paper scraps from my stash. I love the sweet sentiments and Stephanie's playful, handwritten font. A bit of faux stitching around the edges and the cards were done. So quick and easy! Want to see more stamp previews? Head over to Jenn's blog and see what my sweet friend has created. And please visit Carly and Jennifer tomorrow for even more inspiration using the new images. All stamps will go on sale Tuesday, May 3rd in Purple Onion Designs' store.